It's FRIDAY - Do you have plans this weekend? I have 10 simple and quick organizing projects from Monica Ricci that you can accomplish over your weekend to keep you on the "Organize It" journey. 1. Sort and clean out your clothing. Tackle one area at a time. (shoes, tops, pants) This way you can do it in small chunks rather than feeling overwhelmed by doing it all at one time. 3. Tackle a Junk Drawer. Dump, divide and decide. Dump out the drawer, add a drawer divider and decide what stays and what goes. Junk drawers should be thought of as "tool drawers" instead of being a catchall for items that don't have homes. 5. Donate a Bag of Toys. Most kids are overwhelmed with toys. Get a garbage bag and collect the toys your child has lost interest in over the past year. Immediately put the bag into the car to drop at a donation site near you on your next trip out of the house. 6. Declutter a Kitchen Cabinet. Choose the cabinet that makes you craziest. Pull everything out onto the counter top and evaluate each item objectively. Keep only the items you use all the time or are crucial kitchen tools, and box the others for donation. 7. Store and Rotate Decor. Walk around your house and box up about 50% of your decor items. (framed photos, knick-knacks, vases, etc.) Label the boxes and store them away. Twice a year, when you change your clocks, pull out the boxes and exchange the stored items for your current decor. By displaying only half the items you're accustomed to, your home will feel fresh and uncluttered all year long. 8. Minimize Your Media. Sort and cull out unwanted DVDs, CDs, VHS tapes, cassettes, and yes, even those 8-track tapes and vinyl albums you've been holding onto. Keep the ones you still love and pack up the rest to sell or donate. 9. Designate Homes for Daily Travelers. Choose one location in your home for your daily traveling items (purse, briefcase, keys, PDA, cell phone, and iPod) to live so you can quickly and easily find them on your way out the door. 10. Freshen Up Your Fridge. Ditch old and expired condiments, mystery foil packs, and doggie bags gone bad. Add a lazy susan or two to create easy access to items that would normally languish in the deep recesses of your refrigerator shelves. Monica Ricci has been an organizing and productivity specialist since 1999. She offers onsite consulting, as well as motivational seminars and workshops. She has been featured on HGTV's Mission:Organization and is the author of Organize Your Office In No Time. Reach Monica at www.CatalystOrganizing.com or 770-569-2642. Join us for the 24/7 MOMS "FRUGAL LIVING Event"
Two weeks of ideas, resources, tips, FREEbies and giveaways for MOMS. WIN Starbucks: Invite your MOM friends to join us by placing our Frugal Living Event button on your site. (HTML code is on right side of blog). If you place our button on your site, send us an email with your blog address to trisha@247moms.com and you will be entered to WIN a Starbucks gift card. Stop in daily and become a Frugal 24/7 MOM. Thrifty Finds - Freebies, Bargains, coupons and more for moms. Who doesn't love a few FREEbies, Bargains and Coupon offers? Check out this weeks great Thrifty Finds. and receive your FREEbie meal. FREEBie Auntie Anne’s Pretzel - A coupon, delivered to your in-box? How perfect. If you would like to receive a hot, fresh coupon, delivered to your in-box, all you need to do is sign-up at http://www.auntieannes.com/perfect_rewards.aspx You're entitled to one of our Perfect Rewards coupons every month. Sign up to get your coupon. Stop by their site again next month to get a new Pretzel Perfect Reward! Veggie Tales: Check out the Sale going on over at Veggie Tales on DVD’s for $8.97 each and FREE shipping on any order $30 or more until Monday March 2nd. The selection also includes a few Larry Boy DVD’s. Join the brand new Victoria’s Secret PINK Nation for free stuff, exclusive offers, special access, the inside scoop and more! You will receive a FREEbie coupon when you sign-up for a PINK item. I am not sure what the item is yet, as you have to take your coupon into Victoria Secret to redeem it. 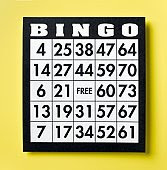 Email us at trisha@247moms.com with your Thrifty Find ideas. Let's Make a Meal Mondays - Slow Cooker BBQ beef. Recently I was asked what I thought the Mom trends were going to be in 2009. I responded with the top 6 trends I felt we would see surface this year. One of these is family dinner time. I explained that I felt family dinner time will be back IN. Families will be back sitting and connecting at the dinner table, thus causing the busy family to look for solutions to simplify their meals, using prepared grocery store foods such as rotisserie chickens or cooking philosophies such as cook once eat twice or make ahead freezer meals. Along with the use of outside meal preparation sources such as Dream Dinners to prepare a month worth of meals, I believe we will definitely see slow cooker sales increase in 2009. I’ve been a BIG slow cooker user for years with a busy household of seven crazy schedules. I t has often been the only way I have been able to consistently have family dinners in our home. The only problem is that my family is in need of new recipes. Yes, I have worn them out on the ones I’ve been cooking. So, I have pulled out my pile of cookbooks and begun searching through them for a few new recipes to try out. One of the cookbooks I have ear-marked several recipes in is Dream Dinners, by Stephanie Allen and Tina Kuna. They have a nice selection of slow cooker recipes along with many others. Place the roast in a crock pot/slow cooker. In a large bowl, combine the remaining ingredients and mix well. If you are preparing a triple batch, pour equal amounts over the three roasts. Cook the roast in the crock pot/slow cooker on the low setting for 6 to 8 hours, until meat falls apart easily. Shred the meat with a fork and serve over hamburger buns or baked potatoes. Label, date, freeze for up to 3 months. Thaw in the refrigerator before cooking as directed above. As the primary cook in the Novotny house I enjoy a night off once in a awhile or better yet a date night with my hubby out to a local restaurant. Being frugal with our money when it comes to eating out means I’m always on the hunt for great restaurant specials and coupons. Today I found several that you to might enjoy using. Join IHOP to celebrate National Pancake Day on Tuesday, February 24, 2009. From 7 a.m. to 10 p.m., they will give you one free stack of their famous buttermilk pancakes. *All they ask is that you consider making a donation to support local Childrens hospitals through Childrens Miracle Network, or other local charities. Click here for additional details http://www.ihoppancakeday.com/. I arrived home this past weekend after leaving my family for 6 days with no mom. The house was picked up, beds were made, floors were vacuumed, bathrooms were spotless - I was impressed! Then I walked into the laundry room only to find piles and piles of laundry, including the overfilled basket that my college son had brought home for Mom to wash. I took a deep breath, and thought I need to appreciate all that my family did as a team to keep the Novotny home in order while Mom was away and realize that I would one day see the bottom of the laundry basket again. Electrolux has teamed up with one of America's favorite moms, Kelly Ripa, to spread a little love via a charitable social media campaign. On the Electrolux Web site, you can create and send a unique virtual cupcake to friends and family during February. For every cupcake sent, Electrolux will donate $1 to the Ovarian Cancer Research Fund (OCRF) as part of their half million dollar commitment to help support this worthy cause. Which means each virtual cupcake will go a long way. What's more, everyone who logs on and sends a cupcake will be entered for a chance to win the newest front-load Washer & Dryer (an estimated $3,600 value) from Electrolux, the appliance brand used throughout fine homes in Europe for 80 years. So, hurry over to the Electrolux web site to send your cupcake and enter to WIN a new washer and dryer set. If you WIN, be sure to email us at trisha@247moms.com and share the news! Freebies, Shopping Bargains and More. Thrifty Tuesday Finds is back with some great Freebies, Online Bargain shopping and more. Do you want to recycle an old monitor? Or trade-in an iPod? We make it easy through our Trade-in and Recycle Program. If you’re a Sam’s Club Member, you can trade in qualified used electronics items. In exchange, we’ll give you a Sam’s Club gift card for the value of your item. If your item doesn’t qualify, we’ll help you recycle it. 2. Enter details about the electronic item you want to trade-in. 3. Find out whether your item qualifies as a trade-in. 4. If your item qualifies, ecoNEW, a company we’re partnering with, will tell you the trade-in value. 5. Learn how to recycle items without trade-in values. 6. Follow packaging instructions for your trade-in or recyclable item. 7. Receive a Sam’s Club gift card in the mail for items with trade-in values. My new favorite place to shop for my two youngest boys is Crazy 8 www.crazy8.com . Sign-up to be on their email list and receive $10.00 off your online order. Offer valid until March 2nd 2009. One of the on going Hot Topics in our mom world is internet safety. We hear and read about it in the news of the horrific, scary and almost un-believable stories of children encountering predators, cyber bullying and receiving unsolicited pornographic material. The truth is our twee ns/teens are the techno generation with the ability to make friendships, play online games and interact with others across the globe, gone are the days of snail mail pen pals. They can send pictures, you tube their videos to be viewed across the world within seconds revealing often who they are, what they look like, what schools they attend and where they live to people they have never meet. They have access to retrieve information in seconds on any topic of their choosing, create online businesses, and the list goes on as to what this techno generation can do. Today’s teens have a knowledge of the Internet that often surpasses that of their parents. Because so many teens are Internet savvy, it is imperative that they also have an understanding of the dangers that exist online and how to deal with them. So, how do we keep this techno generation safe? Thanks to MOMS Central for introducing me to NetSmartz, a leadi ng online resource of the National Center for Missing & Exploited Children has developed a website designed to educate, engage, and empower kids as Internet users. They offer information and support for parents, educators, law enforcement, teens, and kids. They even have a special area for teens where they show videos and comics featuring teen characters that discuss the harm people can cause on the web and also how it can be used in a positive way to empower teens. 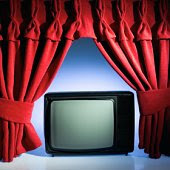 The videos go over topics such as social networking, cyber-bullying, and offline consequences. The cartoon videos also simulate interviews with teens talking about their Internet use. It is all done in a very hip and informative, but not lecturing, way. So, if you need help in your mom world to create discussion about Internet safety, check out NetSmartz! Looking for that last minute creative idea? It does not get any easier than this. T he 18th century ancestor of Hearts was called Reverse, because in this card game, you want to lose certain tricks rather than win them. Players3 to 7, best with 4. Goal At the end of the game, the player with the lowest score wins. * Win all 13 hearts and the Black Maria. SetupIn a 4-player game of Hearts, each player gets 13 cards. In a 3-player game, the 2 of diamonds is removed and each player gets 17 cards. In a 5-player game, the two of diamonds and two of clubs are removed; each player gets 10 cards. In a 6-player game, the two and three of diamonds and the three and four of clubs are removed; each player gets 8 cards. In a 7-player game, the two and three of diamonds and the three of clubs are removed; each player gets 7 cards. Passing Cards - After looking at his or her hand, each player chooses three cards and passes them face down to another player. All players must pass their own cards before looking at the cards received from an opponent. The passing rotation in a 4-player game is: (1st hand) to the player on your left, (2nd hand) to the player on your right, (3rd hand) to the player across the table, (4th hand) no passing. The rotation then repeats until the game ends. When other than four players are involved, the passing rotation is: (1) to the player on your left, (2) to the player on your right, then repeat. Each player must follow suit if possible. If a player has no cards in the suit led, a card of any other suit may be discarded. Exception: If a player has no clubs when the first trick is led, a heart or the Black Maria cannot be played. The highest card of the suit led wins a trick. The winner of the trick keeps all cards won in a single stack in front of himself or herself, face down. The winner of a trick starts the next trick. Hearts may not be led until a heart or the Black Maria has been played (this is called "breaking" hearts). The queen can be led at any time. There is no trump suit in Hearts. Scoring - Use a score sheet with a column for each player. At the end of each hand, count the number of hearts each player has taken, as well as the Black Maria. Hearts are 1 point each; the Black Maria is 13 points. If one player has won all 13 hearts and the Black Maria, that player can choose to subtract 26 points from his or her score, or to add 26 points to every other player's score. Hearts is generally played to 100 points (any score can be agreed on before the game begins, but 50 is a good minimum). When one player hits the agreed upon score or higher, the game ends. The player with the lowest score wins. Note: after each hand, the deal passes to the player on the dealer's left. Everyone loves a treasure hunt. So, each valentines day I create a valentine treasure hunt for my family by hiding their Valentine baskets of goodies. I place written clues around the house in which they work as a team to discover where thier hidden Valentine treasure is. We begin the hunt by giving them their first clue at the dinner table after we have eaten our meal and off teh goto disocver their Valentien treasure. SurpriseHeart Hunt - Fill plastic hearts with goodies and hide them similar to an easter egg hunt. Happy Treasure hunting!Share your Treasure hunting ideas with us by emailing us at trisha@247moms.com. Valentine Idea #6 - Let’s Fondue it! 1. Break chocolate squares into smaller pieces and drop them into the fondue pot. 2. Add cream (which will prevent the chocolate from going lumpy) and stir gently but constantly until the chocolate is melted and smooth. 3. Add vanilla extract, and stir it in. 4. Use a fondue fork to spear the fruit, then dip it in the chocolate. Enjoy! Do you remember your elementary school Valentine's Day parties? My favorite part was passing out and receiving the classmate Valentine cards then sitting at my desk opening each card. Today I have a fun idea to bring back those childhood memories. Purchase a box of inexpensive classmate exchange Valentine cards. Now the fun begins. 2. After your children have fallen asleep on February 13th sneak into their bedrooms and/or bathrooms and place Valentine cards all over these rooms. What a surprise when they wake up to a festive room filled with Valentines. 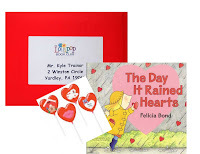 Send some sweet love to child with a Valentine's Day gift package from The Lollipop Book Club. The gift arrives in a bi g red envelope addressed to the child. Think about how much kids love to get mail! The treat inside includes an adorable Valentine's Day book- The Day it Rained Hearts- and a handcrafted Valentine's Day lollipop that is almost too cute to eat. The best part of the gift is that you get to add a personal note, which will be printed on a sticker for the inside of the book. This is your chance to tell a child something special this Valentine's Day! 24/7 MOMS and The Lollipop Book Club are giving away A Valentines Day book and Lollipop. To enter for your chance to win, enter your name and email address in the box below you will be signed up for today's giveaway as well as be added to the 24/7 MOMS E-list(if you are not already a 24/7 MOMS subscriber). Drawing to be held on February 7, 2009. Valentine Idea #4 - Red and Pink Make a Meal. Enjoy your Pink and Red celebration! Valentine Idea #3 - "I Love You Because..."
I, as the Mom, love to hear what each child has written about their siblings, and at least for that moment I feel my children really do love, respect, honor and admire one another... until then next sibling squabble breaks out. Valentine Idea #2 - "Sweets for your Sweetie Swap"
The countdown is on to Valentine's Day in my house. As you know, I love traditions, so my children love to anticipate upcoming holidays. Here at 24/7 MOMS you can anticipate for the next 11 days a new Valentine idea each day giving you simple celebration ideas for both your Valentine and your children. There will even be a few giveaways over the next 11 days, so check in daily. Today we have Valentine Idea #2. Be sure to read yesterday's Valentine Idea #1. It's one of my favorites. "Sweets for Your Sweetie Swap!" Want to shower your sweetie with sweets for Valentine's Day but don't have hours to bake or money to spend? Plan a "Sweets for Your Sweetie Swap!" Similar to a cookie exchange, I invi te friends over and ask them to bring a plate of goodies (homemade or store bought). We have lunch, talk about how much we love our husbands/fiances/boyfriends, and listen to cheesy love songs. After lunch, we set out everyone's goodies and go down the "buffet," packing up sweets for our sweeties! We all go home with cookies, brownies, and candy. Friends, fun, and food? What could be better? Stop by Today's Housewife for great "Sweets for your Sweetie Swap" recipes and ideas.